Editorial, Salomon Group logo on glass building. SLOW MOTION: Unrecognizable person wearing an Adidas sweatshirt rides motorbike. SHENZHEN, CHINA - CIRCA APRIL 2018 : Chinese original shoes brand NEW BUNREN SHOP. SHENZHEN, CHINA - CIRCA NOVEMBER 2018 : View of ANTA SPORTS in Laojie area. 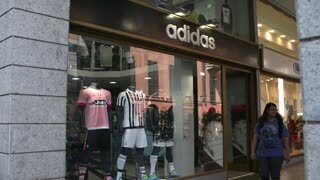 Sportswear brand in China. SHENZHEN, CHINA - CIRCA NOVEMBER 2018 : SUPREME STORE in Shenzhen. This store is similar to American skateboarding shop and clothing brand established in New York City. GUILIN, CHINA - CIRCA NOVEMBER 2018 : STORE with ADIDAS LOGO and NIKE LOGO. NANNING, CHINA - CIRCA NOVEMBER 2018 : STORE with ADIDAS LOGO. NANNING, CHINA - CIRCA NOVEMBER 2018 : STORE with NIKE LOGO. Man walk over a brige in the Park with Adidas Clothes and taking Pictures with his Camera from the Lake. Tying shoelaces of a famouw Brand Sport Shoe. Shot from the front. Adidas logo and store front with people passing by. Adidas is a German multinational corporation, that designs and manufactures shoes, clothing and accessories. Close up of a toddler stomping on dry leaves while wearing Adidas shoes. Only feet are visible. This takes place on a concrete path. On the end she walks away. Tying shoelaces of a famouw Brand Sport Shoe. Shot from the side. 4 Yeezys Belugas and 1 Adidas Ultraboost. Pulling focus between a pair of Adidas shoes. Changing focus between them.